Affirmations are a fantastic way to harness the power of the Law of Attraction. Whether you want to further your career or simply make more money, positive affirmations for promotion can help you get the results you want. Affirmations are short statements repeated frequently that impress upon the subconscious mind what you want to manifest. Affirmations are phrased in the present tense and are positive – phrased as if you already have your desired reality. Positive affirmations can be used to shift your vibrational energy to a higher level, as well as to end negative thinking. By providing a focus for the mind, positive affirmations help you to concentrate on your desires from the end result. You can repeat affirmations for promotion throughout the day, using as much energy and feeling as possible. However, the best time to use affirmations for promotion is in bed as you're drifting off to sleep. The bridge between your conscious and subconscious minds is smallest at this time, allowing you to more easily influence your subconscious mind and, thus, create your manifestation even faster. The speed at which affirmations for promotion work depends on the energy, emotion, belief, and faith you put into your affirmations. I have the perfect job. My promotion pays me the perfect salary. My promotion allows me to spend more time with my family. I know I can do that job as good as, or better than, everyone else. I am the best person for the job. I am rewarded for my hard work and expertise. I can achieve a promotion. I am ready for a promotion. I am successful in a higher position. I am so grateful for the job I have and I am ready for new challenges and responsibility. I have a lot to offer. I am a successful (insert your new job title). I have the perfect promotion for the perfect pay. 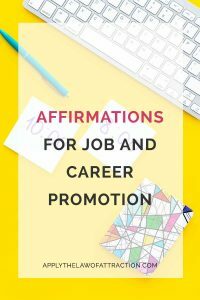 Try using these affirmations for job promotion with the Mirror Technique to really boost your Law of Attraction results.